Welcome! I greet you on behalf of the women of Zeta Phi Beta Sorority, Incorporated, Kappa Epsilon Zeta Chapter. It is my great honor to serve in the position of President of the chapter. 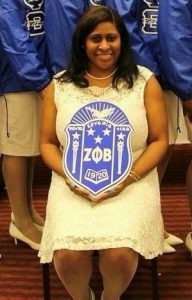 As President, I am committed to providing our members and the community with the utmost service and dedication, and to perpetuate the principles upon which Zeta Phi Beta Sorority, Inc. was founded: Scholarship, Service, Sisterhood and Finer Womanhood. Kappa Epsilon Zeta Chapter has been dedicated to serving the community, supporting education, encouraging our youth and uplifting sisterhood. As members of Kappa Epsilon Zeta Chapter, we look forward to strong community partnerships and alliances that will improve the quality of life for the residents and community of the Bronx. Our commitment of service to the community keeps the chapter actively engaged and connected through our initiatives such as partnerships with the March of Dimes, elder care initiatives, our youth mentoring program Archonette Club and volunteering with programs associated with the Office of the Bronx Borough President. I sincerely thank you for visiting our Website page. Please continue to explore and learn more about our national organization and all of the programs in which Kappa Epsilon Zeta has to offer.